Many IAS aspirants prepare for the exam while doing a job. Their circumstances do not allow them to leave their job and spend long hours for preparation. Often they feel being out competed by those who are preparing full-time. Also, the job holders feel being missed out on the value-addition provided by the coaching centres. But, all this talk is a waste of time and energy. There are many inspirational stories of successful candidates clearing the exam while doing a day job. You too can do it. For those who are unsure of how to prepare for civil services while doing a job, here are a few tips that might help you achieve your goal. The first thing to identify is that you are constrained by time. Having a 9 to 5 job, you will be spending eight hours on your work. If you take mandatory six hours of sleep, then ten hours are left. Of these, if you take away 2 hours for daily chores, eight hours are left. Managing these 8 hrs is crucial for your preparation. Plan thoroughly for these eight hours. You have very limited option of wasting this time. Follow a study routine and stick to it. Cut down or totally eliminate the usage of social media and other channels of entertainment. Avoid all those things and persons who drain your energy and waste your time. Use your office commuting time wisely. If you are using public transportation, you can read a newspaper or listen to audio books and podcasts. Do not take leaves unnecessarily as you might need them at the time of mains preparation. 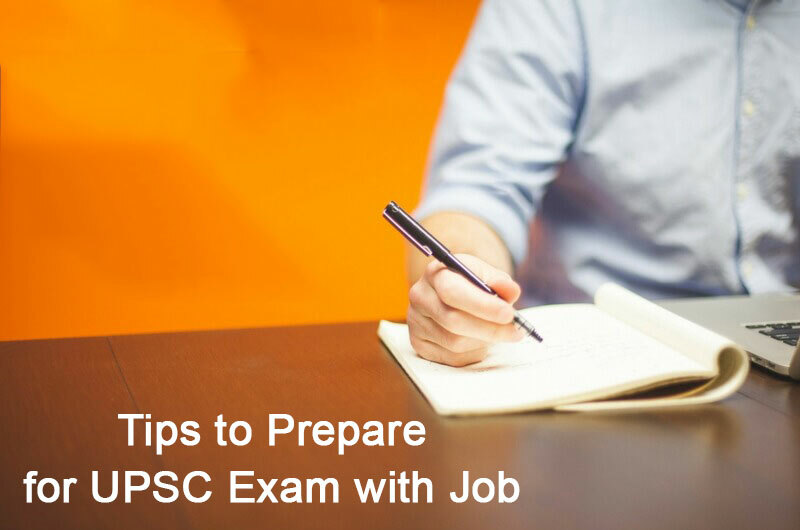 Also Read:- How to Prepare for Civil Services Exam? In the end, do not wait for a perfect time management strategy. Manage your time by understanding your own needs and necessities and plan accordingly. Once you organised your time, set daily, weekly and monthly goals. Make a plan to achieve these goals. As you don’t have the luxury of wasting time, never falter in achieving your goals. Regularly achieving them will give you a boost of energy and confidence in your preparation. Here, do not compare your goals with that of others. As said above, CSE preparation is your won reality. The situation you are in is different from others. So, stop comparing. As you are working, you might have some apprehensions over procuring good study resources. In this day and age, all the content required for CSE preparation are available on the internet. The common books for exam are available pan-India. If you feel that certain study materials for ias of a coaching institute are necessary, you can get them delivered to you. Instead of stashing large volumes of books and materials, do smart preparation. It is common to have doubts if you are a beginner in CSE preparation. As you are working, you might feel that coaching will increase your chances. Preparing for the exam is the primary step and testing that preparation is the next important step. Due to your paucity of time, it is recommended to join an online ias test series and assess your preparation. Also, you can go for postal tests that provide you with tangible question paper to work on. These mock test series will help you identify your grey areas and your strengths. Also, with wider participation of aspirants in these series, you will know your standing among the competition. Thought the test series sort your problem areas at the earliest to stay ahead of others. One thing that is common among both the working and non-working aspirants are the loss of motivation. It happens in the process of preparation. Advices and suggestions can be given like “You stay motivated” etc. But, in the end it is you who has to understand the gravity of the situation and come out of the rut. There is no one else to help you. Top IAS Exam Trending Topic:- How Coaching institute Can help Crack Civil Service Exam? Civil services preparation is a test of perseverance. The long phase of preparation tires the mind and breaks the momentum. You need to be perseverant in achieving those small goals to finally achieve your big dream. Hope these tips are of help to you. Share with us your experiences and suggest more tips.